Sorry, no review of SteamWorld Quest: Hand of Gilgamech yet. Triumph over evil with the hand you’re dealt! 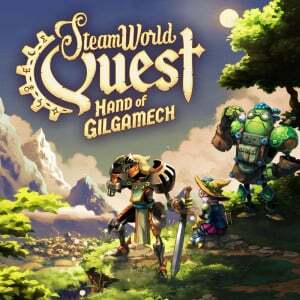 In SteamWorld Quest, lead a party of aspiring heroes through a beautifully hand-drawn world and intense battles, using only your wits and a handful of cards. Take on whatever threat comes your way by crafting your own deck, choosing from over 100 unique punch-cards! What awaits you is a luscious treasure chest filled with gold, dragons, vivid worlds, magic, knights in shining armor as well as XP, turn-based battles and all that good RPG stuff!